The label extended outerwear to puffer coats — including a checked version lined with polar fleece and another in slick, black nylon. 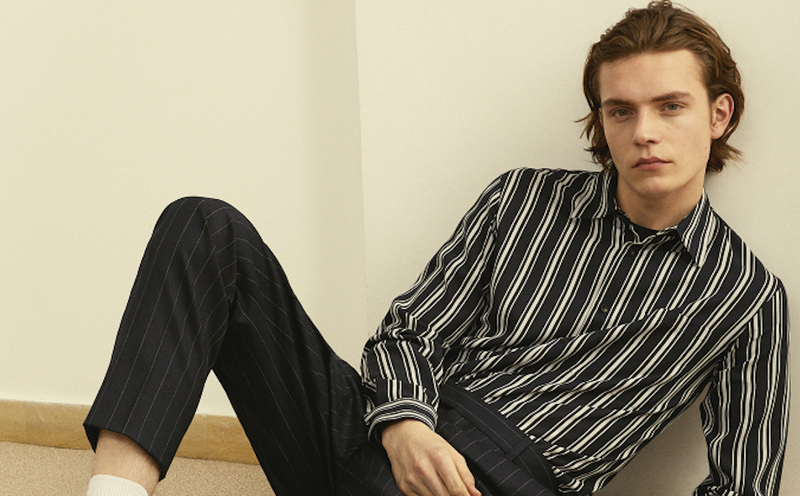 Sandro continues to straddle territory that sits between streetwear and tailoring, offering a clean lineup for fall. “We keep an even keel — there aren’t 360-degree changes in direction here — you could even say it continues along the lines of the summer collection with a mix of sportswear and tailoring references that mingle together; it’s our own style,” said Ilan Chetrite. Quite right, here was classic Sandro, a wide range of smart verging on casual with a comfortable feel. The label’s ongoing emphasis on outerwear extended to puffer coats — the checked version lined with polar fleece and another in slick, black nylon, in cropped, boxy cuts. A hooded model was crafted out of a soft light cotton, in green khaki or navy blue. Collection notes referenced a working class flavor from Morrissey of The Smiths. Translated into Sandro’s universe, there was a houndstooth trenchcoat and black chunky-soled workwear-inspired shoes.